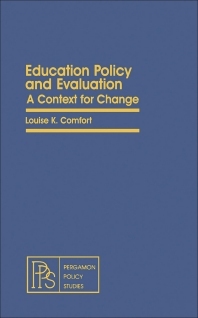 Education Policy and Evaluation: A Context for Change offers one perspective in defining the problems of public policy in education and some suggestions for redirection. Based on research conducted at five major school districts in California, this book reveals children's expectations for public education, as well as the performance of public schools and their vision for the future. The areas of strength and weakness in educational policy are discussed, along with the needs for revision in educational policy and performance. Comprised of seven chapters, this book begins with an assessment of serious failure in public education, citing the proliferation of programs, personnel and administrative structures in public education without adequate design, coordination, implementation, evaluation, or adaptation to meet basic educational needs or to solve the complex problems implicit in the delivery of public educational services. Subsequent chapters focus on the concept of social innovation and the role of the federal government as an agent of educational change; the tension between structure and process in educational policy; the problem of specification in the implementation of educational policy; and evaluation as an instrument for educational change. This monograph will be of interest to students, parents, educators, community leaders, legislators, scholars, school administrators, and educational policymakers.